This article is about the U.S. state of Missouri. For the river, see Missouri River. For other uses, see Missouri (disambiguation). Missouri is a state in the Midwestern United States. With over six million residents, it is the 18th-most populous state of the Union. The largest urban areas are St. Louis, Kansas City, Springfield, and Columbia; the capital is Jefferson City. The state is the 21st-most extensive in area. In the South are the Ozarks, a forested highland, providing timber, minerals, and recreation. The Missouri River, after which the state is named, flows through the center of the state into the Mississippi River, which makes up Missouri's eastern border. Missouri's culture blends elements from the Midwestern and Southern United States. The musical styles of ragtime, Kansas City jazz, and St. Louis Blues developed in Missouri. The well-known Kansas City-style barbecue, and lesser-known St. Louis-style barbecue, can be found across the state and beyond. Missouri is also a major center of beer brewing; Anheuser-Busch is the largest producer in the world. Missouri wine is produced in the nearby Missouri Rhineland and Ozarks. Missouri's alcohol laws are among the most permissive in the United States. Outside of the state's major cities, popular tourist destinations include the Lake of the Ozarks, Table Rock Lake, and Branson. 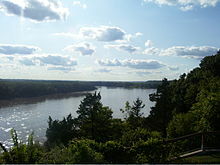 The state is named for the Missouri River, which was named after the indigenous Missouri Indians, a Siouan-language tribe. 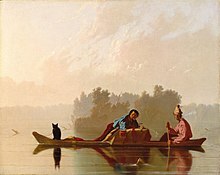 It is said that they were called the ouemessourita (wimihsoorita), meaning "those who have dugout canoes", by the Miami-Illinois language speakers. This appears to be folk etymology—the Illinois spoke an Algonquian language and the closest approximation that can be made in that of their close neighbors, the Ojibwe, is "You Ought to Go Downriver & Visit Those People." This would be an odd occurrence, as the French who first explored and attempted to settle the Mississippi River usually got their translations during that time fairly accurate, often giving things French names that were exact translations of the native tongue(s). Assuming Missouri were deriving from the Siouan language, it would translate as "It connects to the side of it," in reference to the river itself. This is not entirely likely either, as this would be coming out as "Maya Sunni" (Mah-yah soo-nee) Most likely, though, the name Missouri comes from Chiwere, a Siouan language spoken by people who resided in the modern day states of Wisconsin, Iowa, South Dakota, Missouri & Nebraska. listen)), or nothing. Any combination of these phonetic realizations may be observed coming from speakers of American English. The linguistic history was treated definitively by Donald M. Lance, who acknowledged that the question is sociologically complex, but that no pronunciation could be declared "correct", nor could any be clearly defined as native or outsider, rural or urban, southern or northern, educated or otherwise. Politicians often employ multiple pronunciations, even during a single speech, to appeal to a greater number of listeners. Often, informal respellings of the state's name, such as "Missour-ee" or "Missour-uh", are used informally to phonetically distinguish pronunciations. There is no official state nickname. However, Missouri's unofficial nickname is the "Show Me State", which appears on its license plates. This phrase has several origins. One is popularly ascribed to a speech by Congressman Willard Vandiver in 1899, who declared that "I come from a state that raises corn and cotton, cockleburs and Democrats, and frothy eloquence neither convinces nor satisfies me. I'm from Missouri, and you have got to show me." This is in keeping with the saying "I'm from Missouri" which means "I'm skeptical of the matter and not easily convinced." However, according to researchers, the phrase "show me" was already in use before the 1890s. Another one states that it is a reference to Missouri miners who were taken to Leadville, Colorado to replace striking workers. Since the new men were unfamiliar with the mining methods, they required frequent instruction. Other nicknames for Missouri include "The Lead State", "The Bullion State", "The Ozark State", "The Mother of the West", "The Iron Mountain State", and "Pennsylvania of the West". 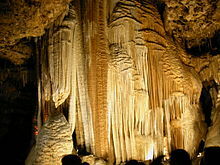 It is also known as the "Cave State" because there are more than 6,000 recorded caves in the state (second to Tennessee). Perry County is the county with the largest number of caves and the single longest cave. The official state motto is Latin: "Salus Populi Suprema Lex Esto", which means "Let the welfare of the people be the supreme law." Missouri, showing major cities and roads. Missouri is landlocked and borders eight different states as does its neighbor, Tennessee. No state in the U.S. touches more than eight. Missouri is bounded by Iowa on the north; by Illinois, Kentucky, and Tennessee across the Mississippi River on the east; on the south by Arkansas; and by Oklahoma, Kansas, and Nebraska (the last across the Missouri River) on the west. Whereas the northern and southern boundaries are straight lines, the Missouri Bootheel protrudes southerly into Arkansas. The two largest rivers are the Mississippi (which defines the eastern boundary of the state) and the Missouri River (which flows from west to east through the state) essentially connecting the two largest metros of Kansas City and St. Louis. Although today it is usually considered part of the Midwest, Missouri was historically seen by many as a border state, chiefly because of the settlement of migrants from the South and its status as a slave state before the Civil War, balanced by the influence of St. Louis. The counties that made up "Little Dixie" were those along the Missouri River in the center of the state, settled by Southern migrants who held the greatest concentration of slaves. In 2005, Missouri received 16,695,000 visitors to its national parks and other recreational areas totaling 101,000 acres (410 km2), giving it $7.41 million in annual revenues, 26.6% of its operating expenditures. North of, and in some cases just south of, the Missouri River lie the Northern Plains that stretch into Iowa, Nebraska, and Kansas. Here, rolling hills remain from the glaciation that once extended from the Canadian Shield to the Missouri River. Missouri has many large river bluffs along the Mississippi, Missouri, and Meramec Rivers. 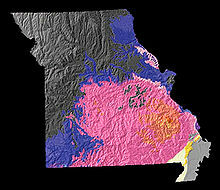 Southern Missouri rises to the Ozark Mountains, a dissected plateau surrounding the Precambrian igneous St. Francois Mountains. This region also hosts karst topography characterized by high limestone content with the formation of sinkholes and caves. The southeastern part of the state is known as the Missouri Bootheel region, which is part of the Mississippi Alluvial Plain or Mississippi embayment. This region is the lowest, flattest, warmest, and wettest part of the state. It is also among the poorest, as the economy there is mostly agricultural. It is also the most fertile, with cotton and rice crops predominant. The Bootheel was the epicenter of the four New Madrid Earthquakes of 1811 and 1812. 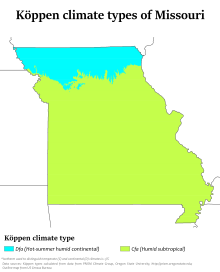 Missouri generally has a humid continental climate with cold snowy winters and hot, humid, and wet summers. In the southern part of the state, particularly in the Bootheel, the climate becomes humid subtropical. Located in the interior United States, Missouri often experiences extreme temperatures. Without high mountains or oceans nearby to moderate temperature, its climate is alternately influenced by air from the cold Arctic and the hot and humid Gulf of Mexico. Missouri's highest recorded temperature is 118 °F (48 °C) at Warsaw and Union on July 14, 1954, while the lowest recorded temperature is −40 °F (−40 °C) also at Warsaw on February 13, 1905. Located in Tornado Alley, Missouri also receives extreme weather in the form of severe thunderstorms and tornadoes. The most recent tornado in the state to cause damage and casualties was the 2011 Joplin tornado, which destroyed roughly one-third of the city of Joplin. The tornado caused an estimated $1–3 billion in damages, killed 159 (+1 non-tornadic), and injured over 1,000 people. It was the first EF5 to hit the state since 1957 and the deadliest in the U.S. since 1947, making it the seventh deadliest tornado in American history and 27th deadliest in the world. St. Louis and its suburbs also have a history of experiencing particularly severe tornadoes, the most recent memorable one being an EF4 tornado that damaged Lambert-St. Louis International Airport on April 22, 2011. One of the worst tornadoes in American history struck St. Louis on May 27, 1896, killing at least 255 and causing $10 mil. damage ($3.9 bil. damage in 2009) or $4.55 billion in today's dollars. Monthly normal high and low temperatures for various Missouri cities in °F (°C). Missouri is home to a diversity of both flora and fauna. There is a large amount of fresh water present due to the Mississippi River, Missouri River, Table Rock Lake and Lake of the Ozarks, with numerous smaller tributary rivers, streams, and lakes. North of the Missouri River, the state is primarily rolling hills of the Great Plains, whereas south of the Missouri River, the state is dominated by the Oak-Hickory Central U.S. hardwood forest. Indigenous peoples inhabited Missouri for thousands of years before European exploration and settlement. Archaeological excavations along the rivers have shown continuous habitation for more than 7,000 years. Beginning before 1000 CE, there arose the complex Mississippian culture, whose people created regional political centers at present-day St. Louis and across the Mississippi River at Cahokia, near present-day Collinsville, Illinois. Their large cities included thousands of individual residences, but they are known for their surviving massive earthwork mounds, built for religious, political and social reasons, in platform, ridgetop and conical shapes. Cahokia was the center of a regional trading network that reached from the Great Lakes to the Gulf of Mexico. The civilization declined by 1400 CE, and most descendants left the area long before the arrival of Europeans. St. Louis was at one time known as Mound City by the European Americans, because of the numerous surviving prehistoric mounds, since lost to urban development. The Mississippian culture left mounds throughout the middle Mississippi and Ohio river valleys, extending into the southeast as well as the upper river. The first European settlers were mostly ethnic French Canadians, who created their first settlement in Missouri at present-day Ste. Genevieve, about an hour south of St. Louis. They had migrated about 1750 from the Illinois Country. They came from colonial villages on the east side of the Mississippi River, where soils were becoming exhausted and there was insufficient river bottom land for the growing population. Sainte-Geneviève became a thriving agricultural center, producing enough surplus wheat, corn and tobacco to ship tons of grain annually downriver to Lower Louisiana for trade. Grain production in the Illinois Country was critical to the survival of Lower Louisiana and especially the city of New Orleans. St. Louis was founded soon after by French fur traders, Pierre Laclède and stepson Auguste Chouteau from New Orleans in 1764. From 1764 to 1803, European control of the area west of the Mississippi to the northernmost part of the Missouri River basin, called Louisiana, was assumed by the Spanish as part of the Viceroyalty of New Spain, due to Treaty of Fontainebleau (in order to have Spain join with France in the war against England). The arrival of the Spanish in St. Louis was in September 1767. St. Louis became the center of a regional fur trade with Native American tribes that extended up the Missouri and Mississippi rivers, which dominated the regional economy for decades. Trading partners of major firms shipped their furs from St. Louis by river down to New Orleans for export to Europe. They provided a variety of goods to traders, for sale and trade with their Native American clients. The fur trade and associated businesses made St. Louis an early financial center and provided the wealth for some to build fine houses and import luxury items. 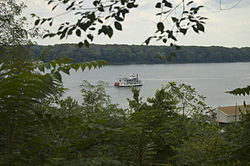 Its location near the confluence of the Illinois River meant it also handled produce from the agricultural areas. River traffic and trade along the Mississippi were integral to the state's economy, and as the area's first major city, St. Louis expanded greatly after the invention of the steamboat and the increased river trade. Napoleon Bonaparte had gained Louisiana for French ownership from Spain in 1800 under the Treaty of San Ildefonso, after it had been a Spanish colony since 1762. But the treaty was kept secret. Louisiana remained nominally under Spanish control until a transfer of power to France on November 30, 1803, just three weeks before the cession to the United States. Part of the 1803 Louisiana Purchase by the United States, Missouri earned the nickname Gateway to the West because it served as a major departure point for expeditions and settlers heading to the West during the 19th century. St. Charles, just west of St. Louis, was the starting point and the return destination of the Lewis and Clark Expedition, which ascended the Missouri River in 1804, in order to explore the western lands to the Pacific Ocean. St. Louis was a major supply point for decades, for parties of settlers heading west. As many of the early settlers in western Missouri migrated from the Upper South, they brought enslaved African Americans as agricultural laborers, and they desired to continue their culture and the institution of slavery. They settled predominantly in 17 counties along the Missouri River, in an area of flatlands that enabled plantation agriculture and became known as "Little Dixie." 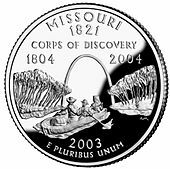 In 1821 the former Missouri Territory was admitted as a slave state, in accordance with the Missouri Compromise, and with a temporary state capital in St. Charles. In 1826, the capital was shifted to its current, permanent location of Jefferson City, also on the Missouri River. The state was rocked by the 1811–12 New Madrid earthquakes. Casualties were few due to the sparse population. Originally the state's western border was a straight line, defined as the meridian passing through the Kawsmouth, the point where the Kansas River enters the Missouri River. The river has moved since this designation. This line is known as the Osage Boundary. In 1836 the Platte Purchase was added to the northwest corner of the state after purchase of the land from the native tribes, making the Missouri River the border north of the Kansas River. This addition increased the land area of what was already the largest state in the Union at the time (about 66,500 square miles (172,000 km2) to Virginia's 65,000 square miles, which then included West Virginia). In the early 1830s, Mormon migrants from northern states and Canada began settling near Independence and areas just north of there. Conflicts over religion and slavery arose between the 'old settlers' (mainly from the South) and the Mormons (mainly from the North). The Mormon War erupted in 1838. By 1839, with the help of an "Extermination Order" by Governor Lilburn Boggs, the old settlers forcefully expelled the Mormons from Missouri and confiscated their lands. Conflicts over slavery exacerbated border tensions among the states and territories. From 1838 to 1839, a border dispute with Iowa over the so-called Honey Lands resulted in both states' calling-up of militias along the border. With increasing migration, from the 1830s to the 1860s Missouri's population almost doubled with every decade. Most of the newcomers were American-born, but many Irish and German immigrants arrived in the late 1840s and 1850s. As a majority were Catholic, they set up their own religious institutions in the state, which had been mostly Protestant. Having fled famine and oppression in Ireland, and revolutionary upheaval in Germany, the immigrants were not sympathetic to slavery. Many settled in cities, where they created a regional and then state network of Catholic churches and schools. Nineteenth-century German immigrants created the wine industry along the Missouri River and the beer industry in St. Louis. Most Missouri farmers practiced subsistence farming before the American Civil War. The majority of those who held slaves had fewer than five each. Planters, defined by some historians as those holding twenty slaves or more, were concentrated in the counties known as "Little Dixie", in the central part of the state along the Missouri River. The tensions over slavery chiefly had to do with the future of the state and nation. In 1860, enslaved African Americans made up less than 10% of the state's population of 1,182,012. In order to control the flooding of farmland and low-lying villages along the Mississippi, the state had completed construction of 140 miles (230 km) of levees along the river by 1860. After the secession of Southern states began in 1861, the Missouri legislature called for the election of a special convention on secession. The convention voted decisively to remain within the Union. Pro-Southern Governor Claiborne F. Jackson ordered the mobilization of several hundred members of the state militia who had gathered in a camp in St. Louis for training. Alarmed at this action, Union General Nathaniel Lyon struck first, encircling the camp and forcing the state troops to surrender. Lyon directed his soldiers, largely non-English-speaking German immigrants, to march the prisoners through the streets, and they opened fire on the largely hostile crowds of civilians who gathered around them. Soldiers killed unarmed prisoners as well as men, women and children of St. Louis in the incident that became known as the "St. Louis Massacre". These events heightened Confederate support within the state. Governor Jackson appointed Sterling Price, president of the convention on secession, as head of the new Missouri State Guard. In the face of Union General Lyon's rapid advance through the state, Jackson and Price were forced to flee the capital of Jefferson City on June 14, 1861. In the town of Neosho, Missouri, Jackson called the state legislature into session. They enacted a secession ordinance. However, even under the Southern view of secession, only the state convention had the power to secede. Since the convention was dominated by unionists, and the state was more pro-Union than pro-Confederate in any event, the ordinance of secession adopted by the legislature is generally given little credence. The Confederacy nonetheless recognized it on October 30, 1861. With the elected governor absent from the capital and the legislators largely dispersed, the state convention was reassembled with most of its members present, save 20 that fled south with Jackson's forces. The convention declared all offices vacant, and installed Hamilton Gamble as the new governor of Missouri. President Lincoln's administration immediately recognized Gamble's government as the legal Missouri government. The federal government's decision enabled raising pro-Union militia forces for service within the state as well as volunteer regiments for the Union Army. Fighting ensued between Union forces and a combined army of General Price's Missouri State Guard and Confederate troops from Arkansas and Texas under General Ben McCulloch. After winning victories at the battle of Wilson's Creek and the siege of Lexington, Missouri and suffering losses elsewhere, the Confederate forces retreated to Arkansas and later Marshall, Texas, in the face of a largely reinforced Union Army. Though regular Confederate troops staged some large-scale raids into Missouri, the fighting in the state for the next three years consisted chiefly of guerrilla warfare. "Citizen soldiers" or insurgents such as Captain William Quantrill, Frank and Jesse James, the Younger brothers, and William T. Anderson made use of quick, small-unit tactics. Pioneered by the Missouri Partisan Rangers, such insurgencies also arose in portions of the Confederacy occupied by the Union during the Civil War. Historians have portrayed stories of the James brothers' outlaw years as an American "Robin Hood" myth. The vigilante activities of the Bald Knobbers of the Ozarks in the 1880s were an unofficial continuation of insurgent mentality long after the official end of the war, and they are a favorite theme in Branson's self-image. Union Station in St. Louis was the largest and busiest train station in the world when it opened in 1894. 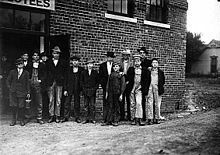 Child shoe workers in Kirksville, Missouri, 1910. Photographed by Lewis Hine as part of the Progressive Era fight against child labor. The Progressive Era (1890s to 1920s) saw numerous prominent leaders from Missouri trying to end corruption and modernize politics, government and society. Joseph "Holy Joe" Folk was a key leader who made a strong appeal to middle class and rural evangelical Protestants. Folk was elected governor as a progressive reformer and Democrat in the 1904 election. He promoted what he called "the Missouri Idea", the concept of Missouri as a leader in public morality through popular control of law and strict enforcement. He successfully conducted antitrust prosecutions, ended free railroad passes for state officials, extended bribery statutes, improved election laws, required formal registration for lobbyists, made racetrack gambling illegal, and enforced the Sunday-closing law. He helped enact Progressive legislation, including an initiative and referendum provision, regulation of elections, education, employment and child labor, railroads, food, business, and public utilities. A number of efficiency-oriented examiner boards and commissions were established during Folk's administration, including many agricultural boards and the Missouri library commission. Between the Civil War and the end of World War II, Missouri transitioned from a rural economy to a hybrid industrial-service-agricultural economy as the Midwest rapidly industrialized. The expansion of railroads to the West transformed Kansas City into a major transportation hub within the nation. The growth of the Texas cattle industry along with this increased rail infrastructure and the invention of the refrigerated boxcar also made Kansas City a major meatpacking center, as large cattle drives from Texas brought herds of cattle to Dodge City and other Kansas towns. There, the cattle were loaded onto trains destined for Kansas City, where they were butchered and distributed to the eastern markets. The first half of the twentieth century was the height of Kansas City's prominence and its downtown became a showcase for stylish Art Deco skyscrapers as construction boomed. In 1930, there was a diphtheria epidemic in the area around Springfield, which killed approximately 100 people. Serum was rushed to the area, and medical personnel stopped the epidemic. During the mid-1950s and 1960s, St. Louis and Kansas City suffered deindustrialization and loss of jobs in railroads and manufacturing, as did other Midwestern industrial cities. In 1956 St. Charles claims to be the site of the first interstate highway project. Such highway construction made it easy for middle-class residents to leave the city for newer housing developed in the suburbs, often former farmland where land was available at lower prices. These major cities have gone through decades of readjustment to develop different economies and adjust to demographic changes. Suburban areas have developed separate job markets, both in knowledge industries and services, such as major retail malls. In 2014, Missouri received national attention for the protests and riots that followed the shooting of Michael Brown by a police officer of Ferguson, which led Governor Jay Nixon to call out the Missouri National Guard. A grand jury declined to indict the officer, and the U.S. Department of Justice concluded, after careful investigation, that the police officer legitimately feared for his safety. However, in a separate investigation, the Department of Justice also found that the Ferguson Police Department and the City of Ferguson relied on unconstitutional practices in order to balance the city's budget through racially motivated excessive fines and punishments, that the Ferguson police "had used excessive and dangerous force and had disproportionately targeted blacks," and that the municipal court "emphasized revenue over public safety, leading to routine breaches of citizens' constitutional guarantees of due process and equal protection under the law." A series of student protests at the University of Missouri against what the protesters viewed as poor response by the administration to racist incidents on campus began in September 2015. On June 7, 2017, the National Association for the Advancement of Colored People issued a warning to prospective African-American travelers to Missouri. This is the first NAACP warning ever covering an entire state. According to a 2018 report by the Missouri Attorney General's office, for the past 18 years, "African Americans, Hispanics and other people of color are disproportionately affected by stops, searches and arrests." The same report found that the biggest discrepancy was in 2017, when "black motorists were 85% more likely to be pulled over in traffic stops". The United States Census Bureau estimates that the population of Missouri was 6,126,452 on July 1, 2018, a 2.30% increase since the 2010 United States Census. 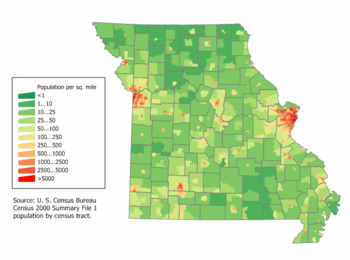 Missouri had a population of 5,988,927, according to the 2010 Census; an increase of 137,525 (2.3 percent) since the year 2010. From 2010 to 2018, this includes a natural increase of 137,564 people since the last census (480,763 births less 343,199 deaths), and an increase of 88,088 people due to net migration into the state. Immigration from outside the United States resulted in a net increase of 50,450 people, and migration within the country produced a net increase of 37,638 people. Over half of Missourians (3,294,936 people, or 55.0%) live within the state's two largest metropolitan areas–St. Louis and Kansas City. The state's population density 86.9 in 2009, is also closer to the national average (86.8 in 2009) than any other state. In 2011, 3.7% of the total population was of Hispanic or Latino origin (they may be of any race). The U.S. Census of 2010 found that the population center of the United States is in Texas County, while the 2000 Census found the mean population center to be in Phelps County. The center of population of Missouri is in Osage County, in the city of Westphalia. In 2004, the population included 194,000 foreign-born (3.4 percent of the state population). The five largest ancestry groups in Missouri are: German (27.4 percent), Irish (14.8 percent), English (10.2 percent), American (8.5 percent) and French (3.7 percent). German Americans are an ancestry group present throughout Missouri. African Americans are a substantial part of the population in St. Louis (56.6% of African Americans in the state lived in St. Louis or St. Louis County as of the 2010 census), Kansas City, Boone County and in the southeastern Bootheel and some parts of the Missouri River Valley, where plantation agriculture was once important. Missouri Creoles of French ancestry are concentrated in the Mississippi River Valley south of St. Louis (see Missouri French). Kansas City is home to large and growing immigrant communities from Latin America esp. Mexico and Colombia, Africa (i.e. Sudan, Somalia and Nigeria), and Southeast Asia including China and the Philippines; and Europe like the former Yugoslavia (see Bosnian American). A notable Cherokee Indian population exists in Missouri. In 2004, 6.6 percent of the state's population was reported as younger than 5 years old, 25.5 percent younger than 18, and 13.5 percent was 65 or older. Females were approximately 51.4 percent of the population. 81.3 percent of Missouri residents were high school graduates (more than the national average), and 21.6 percent had a bachelor's degree or higher. 3.4 percent of Missourians were foreign-born, and 5.1 percent reported speaking a language other than English at home. In 2010, there were 2,349,955 households in Missouri, with 2.45 people per household. The home ownership rate was 70.0 percent, and the median value of an owner-occupied housing unit was $137,700. The median household income for 2010 was $46,262, or $24,724 per capita. There were 14.0 percent (1,018,118) of Missourians living below the poverty line in 2010. The mean commute time to work was 23.8 minutes. In 2011, 28.1% of Missouri's population younger than age 1 were minorities. The vast majority of people in Missouri speak English. Approximately 5.1% of the population reported speaking a language other than English at home. The Spanish language is spoken in small Latino communities in the St. Louis and Kansas City Metro areas. Missouri is home to an endangered dialect of the French language known as Missouri French. Speakers of the dialect, who call themselves Créoles, are descendants of the French pioneers who settled the area then known as the Illinois Country beginning in the late 17th century. It developed in isolation from French speakers in Canada and Louisiana, becoming quite distinct from the varieties of Canadian French and Louisiana Creole French. Once widely spoken throughout the area, Missouri French is now nearly extinct, with only a few elderly speakers able to use it. According to a Pew Research study conducted in 2014, 80% of Missourians identify with a religion. 77% affiliate with Christianity and its various denominations, and the other 3% are adherents of non-Christian religions. The remaining 20% have no religion, with 2% specifically identifying as atheists and 3% identifying as agnostics (the other 15% do not identify as "anything in particular"). The largest denominations by number of adherents in 2010 were the Southern Baptist Convention with 749,685; the Roman Catholic Church with 724,315; and the United Methodist Church with 226,409. Among the other denominations there are approximately 93,000 Mormons in 253 congregations, 25,000 Jewish adherents in 21 synagogues, 12,000 Muslims in 39 masjids, 7,000 Buddhists in 34 temples, 20,000 Hindus in 17 temples, 2,500 Unitarians in 9 congregations, 2,000 Baha'i in 17 temples, 5 Sikh temples, a Zoroastrian temple, a Jain temple and an uncounted number of neopagans. Several religious organizations have headquarters in Missouri, including the Lutheran Church–Missouri Synod, which has its headquarters in Kirkwood, as well as the United Pentecostal Church International in Hazelwood, both outside St. Louis. Independence, near Kansas City, is the headquarters for the Community of Christ (formerly the Reorganized Church of Jesus Christ of Latter Day Saints), the Church of Christ (Temple Lot) and the group Remnant Church of Jesus Christ of Latter Day Saints. This area and other parts of Missouri are also of significant religious and historical importance to The Church of Jesus Christ of Latter-day Saints (LDS Church), which maintains several sites and visitors centers. Springfield is the headquarters of the Assemblies of God USA and the Baptist Bible Fellowship International. The General Association of General Baptists has its headquarters in Poplar Bluff. The Unity Church is headquartered in Unity Village. Hindu Temple of St. Louis is the largest Hindu Temple in Missouri, serving over 14,000 Hindus. The U.S. Department of Commerce’s Bureau of Economic Analysis estimated Missouri's 2016 gross state product at $299.1 billion, ranking 22nd among U.S. states. Per capita personal income in 2006 was $32,705, ranking 26th in the nation. Major industries include aerospace, transportation equipment, food processing, chemicals, printing/publishing, electrical equipment, light manufacturing, financial services and beer. The agriculture products of the state are beef, soybeans, pork, dairy products, hay, corn, poultry, sorghum, cotton, rice, and eggs. Missouri is ranked 6th in the nation for the production of hogs and 7th for cattle. Missouri is ranked in the top five states in the nation for production of soy beans, and it is ranked fourth in the nation for the production of rice. In 2001, there were 108,000 farms, the second-largest number in any state after Texas. Missouri actively promotes its rapidly growing wine industry. According to the Missouri Partnership, Missouri's agriculture industry contributes $33 billion in GDP to Missouri's economy, and generates $88 billion in sales and more than 378,000 jobs. Missouri has vast quantities of limestone. Other resources mined are lead, coal, and crushed stone. Missouri produces the most lead of all of the states. Most of the lead mines are in the central eastern portion of the state. Missouri also ranks first or near first in the production of lime, a key ingredient in Portland cement. Missouri also has a growing science, agricultural technology and biotechnology field. Monsanto, one of the largest biotech companies in America, is based in St. Louis. Tourism, services and wholesale/retail trade follow manufacturing in importance. Tourism benefits from the many rivers, lakes, caves, parks, etc. throughout the state. In addition to a network of state parks, Missouri is home to the Gateway Arch National Park in St. Louis and the Ozark National Scenic Riverways National Park. A much-visited show cave is Meramec Caverns in Stanton, Missouri. Missouri is the only state in the Union to have two Federal Reserve Banks: one in Kansas City (serving western Missouri, Kansas, Nebraska, Oklahoma, Colorado, northern New Mexico, and Wyoming) and one in St. Louis (serving eastern Missouri, southern Illinois, southern Indiana, western Kentucky, western Tennessee, northern Mississippi, and all of Arkansas). The state's seasonally adjusted unemployment rate in April 2017 was 3.9 percent. In 2017, Missouri became a right-to-work state, but in August 2018, Missouri voters rejected a right-to-work law with 67% to 33%. Personal income is taxed in ten different earning brackets, ranging from 1.5% to 6.0%. Missouri's sales tax rate for most items is 4.225% with some additional local levies. More than 2,500 Missouri local governments rely on property taxes levied on real property (real estate) and personal property. Most personal property is exempt, except for motorized vehicles. Exempt real estate includes property owned by governments and property used as nonprofit cemeteries, exclusively for religious worship, for schools and colleges and for purely charitable purposes. There is no inheritance tax and limited Missouri estate tax related to federal estate tax collection. In 2017, the Tax Foundation rated Missouri as having the 5th-best corporate tax index, and the 15th-best overall tax climate. Missouri's corporate income tax rate is 6.25%; however, 50% of federal income tax payments may be deducted before computing taxable income, leading to an effective rate of 5.2%. In 2012, Missouri had roughly 22,000 MW of installed electricity generation capacity. In 2011, 82% of Missouri's electricity was generated by coal. Ten percent was generated from the state's only nuclear power plant, the Callaway Plant in Callaway County, northeast of Jefferson City. Five percent was generated by natural gas. One percent was generated by hydroelectric sources, such as the dams for Truman Lake and Lake of the Ozarks. Missouri has a small but growing amount of wind and solar power—wind capacity increased from 309 MW in 2009 to 459 MW in 2011, while photovoltaics have increased from 0.2 MW to 1.3 MW over the same period. As of 2016, Missouri's solar installations had reached 141 MW. Oil wells in Missouri produced 120,000 barrels of crude oil in fiscal 2012. There are no oil refineries in Missouri. Missouri has two major airport hubs: Lambert–St. Louis International Airport and Kansas City International Airport. Southern Missouri has the Springfield–Branson National Airport (SGF) with multiple non-stop destinations. Residents of Mid-Missouri use Columbia Regional Airport (COU) to fly to Chicago (ORD), Dallas (DFW) or Denver (DEN). Two of the nation's three busiest rail centers are in Missouri. Kansas City is a major railroad hub for BNSF Railway, Norfolk Southern Railway, Kansas City Southern Railway, and Union Pacific Railroad, and every class 1 railroad serves Missouri. Kansas City is the second largest freight rail center in the US (but is first in the amount of tonnage handled). Like Kansas City, St. Louis is a major destination for train freight. Springfield remains an operational hub for BNSF Railway. Amtrak passenger trains serve Kansas City, La Plata, Jefferson City, St. Louis, Lee's Summit, Independence, Warrensburg, Hermann, Washington, Kirkwood, Sedalia, and Poplar Bluff. A proposed high-speed rail route in Missouri as part of the Chicago Hub Network has received $31 million in funding. The only urban light rail/subway system operating in Missouri is MetroLink, which connects the city of St. Louis with suburbs in Illinois and St. Louis County. It is one of the largest systems (by track mileage) in the United States. The KC Streetcar in downtown Kansas City opened in May 2016. The Gateway Multimodal Transportation Center in St. Louis is the largest active multi-use transportation center in the state. It is in downtown St. Louis, next to the historic Union Station complex. It serves as a hub center/station for MetroLink, the MetroBus regional bus system, Greyhound, Amtrak, and taxi services. The proposed Missouri Hyperloop would connect St. Louis, Kansas City, and Columbia, reducing travel times to around a half hour. Many cities have regular fixed-route systems, and many rural counties have rural public transit services. Greyhound and Trailways provide inter-city bus service in Missouri. Megabus serves St. Louis, but discontinued service to Columbia and Kansas City in 2015. The Mississippi River and Missouri River are commercially navigable over their entire lengths in Missouri. The Missouri was channelized through dredging and jettys and the Mississippi was given a series of locks and dams to avoid rocks and deepen the river. St. Louis is a major destination for barge traffic on the Mississippi. Following the passage of Amendment 3 in late 2004, the Missouri Department of Transportation (MoDOT) began its Smoother, Safer, Sooner road-building program with a goal of bringing 2,200 miles (3,500 km) of highways up to good condition by December 2007. From 2006 to 2010 traffic deaths have decreased annually from 1,257 in 2005, to 1,096 in 2006, to 992 for 2007, to 960 for 2008, to 878 in 2009, to 821 in 2010. 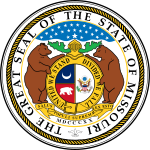 The current Constitution of Missouri, the fourth constitution for the state, was adopted in 1945. It provides for three branches of government: the legislative, judicial, and executive branches. The legislative branch consists of two bodies: the House of Representatives and the Senate. These bodies comprise the Missouri General Assembly. The House of Representatives has 163 members who are apportioned based on the last decennial census. The Senate consists of 34 members from districts of approximately equal populations. 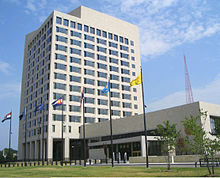 The judicial department comprises the Supreme Court of Missouri, which has seven judges, the Missouri Court of Appeals (an intermediate appellate court divided into three districts), sitting in Kansas City, St. Louis, and Springfield, and 45 Circuit Courts which function as local trial courts. The executive branch is headed by the Governor of Missouri and includes five other statewide elected offices. Following the death of Tom Schweich in 2015, only one of Missouri's statewide elected offices are held by Democrats. Harry S Truman (1884–1972), the 33rd President of the United States (Democrat, 1945–1953), was born in Lamar. He was a judge in Jackson County and then represented the state in the United States Senate for ten years, before being elected Vice-President in 1944. He lived in Independence after retiring. Missouri was widely regarded as a bellwether in American politics, often making it a swing state. 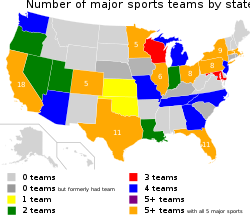 The state had a longer stretch of supporting the winning presidential candidate than any other state, having voted with the nation in every election from 1904 to 2004 with a single exception: 1956, when Democratic candidate Adlai Stevenson of neighboring Illinois lost the election despite carrying Missouri. However, in recent years, areas of the state outside Kansas City, St. Louis, and Columbia have shifted heavily to the right, and so the state is no longer considered a bellwether by most analysts. Missouri twice voted against Democrat Barack Obama, who won in 2008 and 2012. Missouri voted for Romney by nearly 10% in 2012. On October 24, 2012, there were 4,190,936 registered voters. At the state level, both Democratic Senator Claire McCaskill and Democratic Governor Jay Nixon were re-elected. On November 8, 2016, there were 4,223,787 registered voters, with 2,811,549 voting (66.6%). Missouri has been known for its population's generally "stalwart, conservative, noncredulous" attitude toward regulatory regimes, which is one of the origins of the state's unofficial nickname, the "Show-Me State". As a result, and combined with the fact that Missouri is one of America's leading alcohol states, regulation of alcohol and tobacco in Missouri is among the most laissez-faire in America. For 2013, the annual "Freedom in the 50 States" study prepared by the Mercatus Center at George Mason University ranked Missouri as #3 in America for alcohol freedom and #1 for tobacco freedom (#7 for freedom overall). The study notes that Missouri's "alcohol regime is one of the least restrictive in the United States, with no blue laws and taxes well below average", and that "Missouri ranks best in the nation on tobacco freedom". Missouri law makes it "an improper employment practice" for an employer to refuse to hire, to fire, or otherwise to disadvantage any person because that person lawfully uses alcohol and/or tobacco products when he or she is not at work. With a large German immigrant population and the development of a brewing industry, Missouri always has had among the most permissive alcohol laws in the United States. It never enacted statewide prohibition. Missouri voters rejected prohibition in three separate referenda in 1910, 1912, and 1918. Alcohol regulation did not begin in Missouri until 1934. Today, alcohol laws are controlled by the state government, and local jurisdictions are prohibited from going beyond those state laws. Missouri has no statewide open container law or prohibition on drinking in public, no alcohol-related blue laws, no local option, no precise locations for selling liquor by the package (allowing even drug stores and gas stations to sell any kind of liquor), and no differentiation of laws based on alcohol percentage. State law protects persons from arrest or criminal penalty for public intoxication. Missouri law expressly prohibits any jurisdiction from going dry. Missouri law also expressly allows parents and guardians to serve alcohol to their children. The Power & Light District in Kansas City is one of the few places in the United States where a state law explicitly allows persons over the age of 21 to possess and consume open containers of alcohol in the street (as long as the beverage is in a plastic cup). As for tobacco (as of July 2016), Missouri has the lowest cigarette excise taxes in the United States, at 17 cents per pack, and the state electorate voted in 2002, 2006, 2012, and twice in 2016 to keep it that way. In 2007, Forbes named Missouri's largest metropolitan area, St. Louis, America's "best city for smokers". According to the Centers for Disease Control and Prevention, in 2008 Missouri had the fourth highest percentage of adult smokers among U.S states, at 24.5%. Although Missouri's minimum age for purchase and distribution of tobacco products is 18, tobacco products can be distributed to persons under 18 by family members on private property. No statewide smoking ban ever has been seriously entertained before the Missouri General Assembly, and in October 2008, a statewide survey by the Missouri Department of Health and Senior Services found that only 27.5% of Missourians support a statewide ban on smoking in all bars and restaurants. Missouri state law permits restaurants seating less than 50 people, bars, bowling alleys, and billiard parlors to decide their own smoking policies, without limitation. Missouri has 114 counties and one independent city (St. Louis). The largest county by size is Texas County (1,179 sq. miles) and Shannon County is second (1,004 sq. miles). Worth County is the smallest (266 sq. miles). The independent city of St. Louis has only 62 square miles (160 km2) of area. St. Louis City is the most densely populated area (5,140.1 per sq. mi.) in Missouri. The largest county by population (2017 estimate) is St. Louis County (996,726 residents), with Jackson County second (698,895 residents), St. Charles third (395,504), and St. Louis fourth (308,626). Worth County is the least populous with 2,057 (2017 estimate) residents. Jefferson City is the capital of Missouri. The five largest cities in Missouri are Kansas City, St. Louis, Springfield, Columbia, and Independence. St. Louis is the principal city of the largest metropolitan area in Missouri, composed of 17 counties and the independent city of St. Louis; eight of those counties lie in Illinois. As of 2017 St. Louis was the 21st-largest metropolitan area in the nation with 2.81 million people. However, if ranked using Combined Statistical Area, it is 19th-largest with 2.91 million people in 2017. Some of the major cities making up the St. Louis Metro area in Missouri are O'Fallon, St. Charles, St. Peters, Florissant, Chesterfield, Wentzville, Wildwood, University City, and Ballwin. Kansas City is Missouri's largest city and the principal city of the fifteen-county Kansas City Metropolitan Statistical Area, including six counties in the state of Kansas. As of 2017, it was the 30th-largest metropolitan area in the nation, with 2.13 million people. In the Combined Statistical Area in 2017, it ranked 25th with 2.47 million. Some of the other major cities comprising the Kansas City metro area in Missouri include Independence, Lee's Summit, Blue Springs, Liberty, Raytown, Gladstone, and Grandview. Springfield is Missouri's third-largest city and the principal city of the Springfield-Branson Metropolitan Area, which has a population of 549,423 and includes seven counties in southwestern Missouri. Branson is a major tourist attraction in the Ozarks of southwestern Missouri. Some of the other major cities comprising the Springfield-Branson metro area include Nixa, Ozark, and Republic. The Missouri State Board of Education has general authority over all public education in the state of Missouri. It is made up of eight citizens appointed by the governor and confirmed by the Missouri Senate. Education is compulsory from ages seven to seventeen, and it is required that any parent, guardian or other person with custody of a child between the ages of seven and seventeen the compulsory attendance age for the district, must ensure that the child is enrolled in and regularly attends public, private, parochial school, home school or a combination of schools for the full term of the school year. Compulsory attendance also ends when children complete sixteen credits in high school. Children in Missouri between the ages of five and seven are not required to be enrolled in school. However, if they are enrolled in a public school their parent, guardian or custodian must ensure that they regularly attend. Missouri schools are commonly but not exclusively divided into three tiers of primary and secondary education: elementary school, middle school or junior high school and high school. The public schools system includes kindergarten to 12th grade. District territories are often complex in structure. In some cases, elementary, middle and junior high schools of a single district feed into high schools in another district. High school athletics and competitions are governed by the Missouri State High School Activities Association (MSHSAA). Another gifted school is the Missouri Academy of Science, Mathematics and Computing, which is at the Northwest Missouri State University. Brookings Hall at Washington University in St. Louis. The University of Missouri System is Missouri's statewide public university system. The flagship institution and largest university in the state is the University of Missouri in Columbia. The others in the system are University of Missouri–Kansas City, University of Missouri–St. Louis, and Missouri University of Science and Technology in Rolla. During the late nineteenth and early twentieth century the state established a series of normal schools in each region of the state, originally named after the geographic districts: Northeast Missouri State University (now Truman State University) (1867), Central Missouri State University (now the University of Central Missouri) (1871), Southeast Missouri State University (1873), Southwest Missouri State University (now Missouri State University) (1905), Northwest Missouri State University (1905), Missouri Western State University (1915), Maryville University (1872) and Missouri Southern State University (1937). Lincoln University and Harris–Stowe State University were established in the mid-nineteenth century and are historically black colleges and universities. Among private institutions Washington University in St. Louis and Saint Louis University are two top ranked schools in the US. There are numerous junior colleges, trade schools, church universities and other private universities in the state. A.T. Still University was the first osteopathic medical school in the world. Hannibal–LaGrange University in Hannibal, Missouri, was one of the first colleges west of the Mississippi (founded 1858 in LaGrange, Missouri, and moved to Hannibal in 1928). The state funds a $2000, renewable merit-based scholarship, Bright Flight, given to the top three percent of Missouri high school graduates who attend a university in-state. The 19th century border wars between Missouri and Kansas have continued as a sports rivalry between the University of Missouri and University of Kansas. The rivalry was chiefly expressed through football and basketball games between the two universities, but since Missouri left the Big 12 Conference in 2012, the teams no longer regularly play one another. It was the oldest college rivalry west of the Mississippi River and the second-oldest in the nation. Each year when the universities met to play, the game was coined the "Border War." An exchange occurred following the game where the winner took a historic Indian War Drum, which had been passed back and forth for decades. Though Missouri and Kansas no longer have an annual game after the University of Missouri moved to the Southeastern Conference, tension still exists between the two schools. 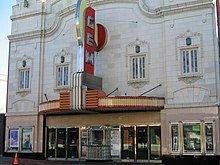 The historic Gem Theatre, located in Kansas City's renowned 18th and Vine Jazz District. Many well-known musicians were born or have lived in Missouri. These include guitarist and rock pioneer Chuck Berry, singer and actress Josephine Baker, "Queen of Rock" Tina Turner, pop singer-songwriter Sheryl Crow, Michael McDonald of the Doobie Brothers, and rappers Nelly, Chingy and Akon, all of whom are either current or former residents of St. Louis. Country singers from Missouri include New Franklin native Sara Evans, Cantwell native Ferlin Husky, West Plains native Porter Wagoner, Tyler Farr of Garden City, and Mora native Leroy Van Dyke, along with bluegrass musician Rhonda Vincent, a native of Greentop. Rapper Eminem was born in St. Joseph and also lived in Savannah and Kansas City. Ragtime composer Scott Joplin lived in St. Louis and Sedalia. Jazz saxophonist Charlie Parker lived in Kansas City. Rock and Roll singer Steve Walsh of the group Kansas was born in St. Louis and grew up in St. Joseph. The Kansas City Symphony and the St. Louis Symphony Orchestra are the state's major orchestras. The latter is the nation's second-oldest symphony orchestra and achieved prominence in recent years under conductor Leonard Slatkin. Branson is well known for its music theaters, most of which bear the name of a star performer or musical group. Missouri is the native state of Mark Twain. His novels The Adventures of Tom Sawyer and The Adventures of Huckleberry Finn are set in his boyhood hometown of Hannibal. Authors Kate Chopin, T. S. Eliot and Tennessee Williams were from St. Louis. Kansas City-born writer William Least Heat-Moon resides in Rocheport. He is best known for Blue Highways, a chronicle of his travels to small towns across America, which was on The New York Times Bestseller list for 42 weeks in 1982–1983. Filmmaker, animator, and businessman Walt Disney spent part of his childhood in the Linn County town of Marceline before settling in Kansas City. Disney began his artistic career in Kansas City, where he founded the Laugh-O-Gram Studio. Several film versions of Mark Twain's novels The Adventures of Tom Sawyer and The Adventures of Huckleberry Finn have been made. Meet Me in St. Louis, a musical involving the 1904 St. Louis World's Fair, starred Judy Garland. Part of the 1983 road movie National Lampoon's Vacation was shot on location in Missouri, for the Griswolds' trip from Chicago to Los Angeles. The Thanksgiving holiday film Planes, Trains, and Automobiles was partially shot at Lambert–St. Louis International Airport. 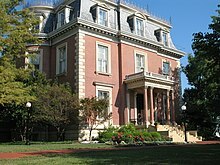 White Palace was filmed in St. Louis. The award-winning 2010 film Winter's Bone was shot in the Ozarks of Missouri. Up in the Air starring George Clooney was filmed in St. Louis. John Carpenter's Escape from New York was filmed in St. Louis during the early 1980s due to the large number of abandoned buildings in the city. The 1973 movie Paper Moon, which starred Ryan and Tatum O'Neal, was partly filmed in St. Joseph. Most of HBO's film Truman (1995) was filmed in Kansas City, Independence, and the surrounding area; Gary Sinise won an Emmy for his portrayal of Harry Truman in the film. 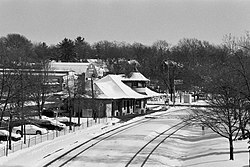 Ride With the Devil (1999), starring Jewel and Tobey Maguire, was filmed in the countryside of Jackson County (where the historic events of the film actually took place). Gone Girl, a 2014 film starring Ben Affleck, Rosamund Pike, Neil Patrick Harris, and Tyler Perry, was filmed in Cape Girardeau. Missouri hosted the 1904 Summer Olympics at St. Louis, the first time the games were hosted in the United States. The St. Louis Cardinals playing at Busch Stadium. Missouri has four major sports teams: the Royals and Cardinals of MLB, the Chiefs of the NFL, and the Blues of the NHL. ^ "Elevations and Distances in the United States". United States Geological Survey. 2001. Archived from the original on October 15, 2011. Retrieved October 24, 2011. ^ "Census Regions of the United States" (PDF). www.census.gov. U.S. Census Bureau. Retrieved January 9, 2017. ^ Fe, Mailing Address: National Trails Intermountain Region Pony Express National Historic Trail PO Box 728 Santa; Us, NM 87504 Phone:741-1012 Contact. "Pony Express National Historic Trail (U.S. National Park Service)". www.nps.gov. ^ "Hey Heidi: How did the Show Me State come about?". ^ Buechel, Eugene & Manhart S.J., Paul "Lakota Dictionary: Lakota-English / English-Lakota, New Comprehensive Edition" 2002. ^ a b Wheaton, Sarah (October 13, 2012). "Missouree? Missouruh? To Be Politic, Say Both". The New York Times. pp. A1. Retrieved October 14, 2012. ^ Missouri – Definition and More from the Free Merriam-Webster Dictionary. Merriam-webster.com (August 31, 2012). Retrieved July 21, 2013. ^ a b Lance, Donald M. (Fall 2003). "The Pronunciation of Missouri: Variation and Change in American English". American Speech. 78 (3): 255–284. doi:10.1215/00031283-78-3-255. ^ Lance, Donald M. (September 17, 2003). "The Pronunciation of Missouri : Variation and Change in American English". American Speech. 78 (3): 255–284. doi:10.1215/00031283-78-3-255 – via Project MUSE. ^ a b "Origin of "Show-Me" Slogan". State Archives Missouri History (FAQ). MO: Secretary of State. Retrieved February 20, 2010. ^ "skepticism" – via The Free Dictionary. ^ House, Scott (May 14, 2005). "Fact Sheet on 6000 Caves". The Missouri Speleological Survey. Archived from the original on May 9, 2008. Retrieved March 16, 2008. ^ "Midwest Region Economy at a Glance". Bls.gov. Retrieved July 31, 2010. ^ "UNC-CH surveys reveal where the 'real' South lies". Unc.edu. June 2, 1999. Retrieved July 31, 2010. ^ a b Almanac of the 50 States (Missouri). Information Publications (Woodside, California). 2008. p. 203. ^ "Missouri's Karst Wonderland – Missouri State Parks and Historic Sites, DNR". Mostateparks.com. June 6, 2008. Archived from the original on February 28, 2010. Retrieved February 20, 2010. ^ "Income Inequality in Missouri". Ded.mo.gov. December 21, 2001. Archived from the original on January 7, 2010. Retrieved July 31, 2010. ^ "MISSOURI V. IOWA, 48 U.S. 660 (1849) – US Supreme Court Cases from Justia & Oyez". Supreme.justia.com. Retrieved July 31, 2010. ^ Historical Census Browser, 1860 Federal Census, University of Virginia Library Archived December 6, 2009, at the Wayback Machine. Retrieved March 21, 2008. ^ Steckmesser Kent L (1966). "Robin Hood and the American Outlaw: A Note on History and Folklore". Journal of American Folklore. 79 (312): 348–355. JSTOR 538043. ^ "First interstate project". Fhwa.dot.gov. Retrieved May 6, 2014. ^ Eliott C. McLaughlin, "What we know about Michael Brown's shooting", CNN, August 15, 2014, http://www.cnn.com/2014/08/11/us/missouri-ferguson-michael-brown-what-we-know/index.html. ^ David Carr, "View of #Ferguson Thrust Michael Brown Shooting to National Attention", ''The New York Times, August 17, 2014, https://www.nytimes.com/2014/08/18/business/media/view-of-ferguson-thrust-michael-brown-shooting-to-national-attention.html. ^ Jamelle Bouiewhich, "Why the Fires in Ferguson Won’t End Soon", Slate (magazine), August 19, 2014, http://www.slate.com/articles/news_and_politics/politics/2014/08/ferguson_protests_over_michael_brown_won_t_end_soon_the_black_community.html. ^ Davey, Monica; Eligon, John; Blinder, Alan (August 19, 2014). "National Guard Troops Fail to Quell Unrest in Ferguson". The New York Times. Retrieved August 19, 2014. ^ Hartmann, Margaret. "National Guard Deployed After Chaotic, Violent Night in Ferguson". NY Magazine. Retrieved August 18, 2014. ^ U.S. Department of Justice, DEPARTMENT OF JUSTICE REPORT REGARDING THE CRIMINAL INVESTIGATION INTO THE SHOOTING DEATH OF MICHAEL BROWN BY FERGUSON, MISSOURI POLICE OFFICER DARREN WILSON, March 4, 2015, https://www.justice.gov/sites/default/files/opa/press-releases/attachments/2015/03/04/doj_report_on_shooting_of_michael_brown_1.pdf. ^ Apuzzo, Matt (March 3, 2015). "Ferguson Police Routinely Violate Rights of Blacks, Justice Dept. Finds". New York Times. Retrieved March 4, 2015. ^ NBC News, "Report on Ferguson Exposes Broader Effort to Reform Municipal Courts", March 3, 2015, http://www.nbcnews.com/storyline/michael-brown-shooting/report-ferguson-exposes-broader-effort-reform-municipal-courts-n316716. ^ Naskidashvili, Nana (October 1, 2015). "Students march through MU Student Center in protest of racial injustice". Columbia Missourian. Retrieved November 11, 2015. ^ Plaster, Madison (October 1, 2015). "Second 'Racism Lives Here' event calls for administration to act on social injustices". The Maneater. Retrieved November 11, 2015. ^ "retrieved August 7, 2017". ^ Nancy Coleman, "NAACP issues its first statewide travel advisory, for Missouri", CNN, August 3, 2017, http://www.cnn.com/2017/08/02/us/naacp-missouri-travel-advisory-trnd/index.html. ^ Gold, Alison (June 1, 2018). "Black Drivers Stopped in Missouri at a Rate 85 Percent Higher Than Whites". Riverfront Times. ^ Lartey, Jamiles (July 5, 2018). "'Predatory police': the high price of driving while black in Missouri". The Guardian. ^ "Resident Population Data". Census. 2010. Archived from the original on October 28, 2011. Retrieved December 24, 2012. ^ a b "QuickFacts Missouri; UNITED STATES". 2018 Population Estimates. United States Census Bureau, Population Division. February 6, 2019. Retrieved February 6, 2019. ^ Population Division, Laura K. Yax. "Historical Census Statistics on Population Totals By Race, 1790 to 1990, and By Hispanic Origin, 1970 to 1990, For The United States, Regions, Divisions, and States". Archived from the original on July 25, 2008. ^ "Population of Missouri: Census 2010 and 2000 Interactive Map, Demographics, Statistics, Quick Facts". ^ "Population and Population Centers by State". United States Census Bureau. 2000. Archived from the original on December 12, 2001. Retrieved December 5, 2008. ^ "Latinos in Missouri" (PDF). ^ Ammon, Ulrich (1989). Status and Function of Languages and Language Varieties. Walter de Gruyter. pp. 306–8. ISBN 978-0-89925-356-5. Retrieved September 3, 2010. ; International Sociological Association. ^ Carrière, J-M (1939). "Creole Dialect of Missouri". American Speech. 14 (2): 109–19. doi:10.2307/451217. JSTOR 451217. ^ a b "Religious Landscape Study". May 11, 2015. ^ Kellie Moore (February 25, 2013). "Fox apologizes for comments on Wiccans at University of Missouri". Religious News Service. Retrieved December 23, 2013. ^ "Gross Domestic Product by State: Third Quarter 2017" (PDF) (Press release). U.S. Bureau of Economic Analysis. January 24, 2018. Archived from the original (PDF) on April 23, 2018. Retrieved May 1, 2018. ^ "Missouri Partnership | Economic Development | Global Agtech Leader". www.missouripartnership.com. Retrieved May 17, 2017. ^ "FRB: Federal Reserve Districts and Banks". Federalreserve.gov. December 13, 2005. Retrieved February 20, 2010. ^ "DED Releases April 2017 Jobs Report". Missouri Department of Economic Development. May 16, 2017. Retrieved May 17, 2017. ^ "Governor Greitens Signs Right To Work into Missouri Law – Missouri Partnership". www.missouripartnership.com. Retrieved May 17, 2017. ^ "Right-to-work overturned as Prop A fails". August 8, 2018. ^ "Missouri voters reject rights to work" (PDF). www.bizjournals.com. 2018. ^ a b "2017 State Business Tax Climate Index - Tax Foundation". Tax Foundation. September 28, 2016. Retrieved May 17, 2017. ^ "Missouri Partnership | Economic Development | Location | Low Business Costs". www.missouripartnership.com. Retrieved May 17, 2017. ^ "Missouri Electricity Profile 2012". U.S. Energy Information Administration. May 1, 2014. Retrieved May 17, 2014. ^ a b c d National Association for State Energy Officials and the Kentucky Department for Energy Development and Independence. "Missouri Energy Profile" (PDF). Archived from the original (PDF) on June 3, 2014. Retrieved July 14, 2013. ^ a b Sherwood, Larry (July 2010). "U.S. Solar Market Trends 2009" (PDF). Interstate Renewable Energy Council (IREC). Archived from the original (PDF) on September 25, 2010. Retrieved July 28, 2010. ^ "Missouri Partnership | Economic Development | Empowered Energy Solutions". www.missouripartnership.com. Retrieved May 17, 2017. ^ Missouri Department of Natural Resources. "Geologicaly Survey Program – Oil and Gas in Missouri". Retrieved July 14, 2013. ^ United States Energy Information Administration. "Petroleum and Other Liquids – Number and Capacity of Petroleum Refineries". Retrieved July 14, 2013. ^ "Non-stop Destinations | Springfield-Branson National Airport (SGF)". flyspringfield.com. Retrieved January 18, 2016. ^ "Columbia Regional Airport". www.flycou.com. Retrieved January 18, 2016. ^ "Fact Sheet: High Speed Intercity Passenger Rail Program: Chicago – St. Louis – Kansas City". Retrieved January 28, 2010. ^ "KC Streetcar – About KC Streetcar". Archived from the original on October 29, 2013. Retrieved October 27, 2013. ^ della Cava, Marco (January 30, 2018). "Is Missouri ready for 700 mph hyperloop commutes?". usatoday.com. Retrieved 28 March 2019. ^ "Megabus canceling service in Kansas City, Columbia". kansascity. Retrieved January 18, 2016. ^ "Number of Persons Killed or Injured in Missouri Crashes by Year". Missouri State Highway Patrol. Retrieved September 30, 2012. 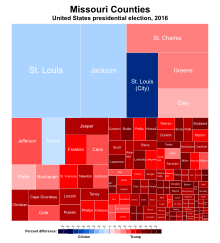 ^ "Registered Voters in Missouri 2012". Missouri Secretary of State. October 24, 2012. Retrieved October 28, 2012. ^ "Voter Turnout Report: 2016 General Election" (PDF). Missouri Secretary of State. November 8, 2016. Retrieved October 26, 2017. ^ "Missouri Secretary of State – State Archives – Origin of "Show Me" slogan". Sos.mo.gov. Retrieved July 31, 2010. ^ a b Mercatus Center (March 28, 2013). "Freedom in the 50 States-Missouri". Freedom in the 50 States. George Mason University. Retrieved March 29, 2013. ^ "Mo. Rev. Stat. § 290.145". Moga.mo.gov. August 28, 2009. Archived from the original on August 8, 2010. Retrieved July 31, 2010. ^ "Mo. Rev. Stat. § 67.305". Moga.mo.gov. August 28, 2009. Archived from the original on July 1, 2010. Retrieved July 31, 2010. ^ "Mo. Rev. Stat. § 311.170". Moga.mo.gov. August 28, 2009. Archived from the original on August 30, 2010. Retrieved July 31, 2010. ^ "Mo. Rev. Stat. § 311.310". Moga.mo.gov. August 28, 2009. Archived from the original on May 27, 2010. Retrieved July 31, 2010. ^ "Mo. Rev. Stat. § 311.086". Moga.mo.gov. August 28, 2009. Archived from the original on August 29, 2010. Retrieved July 31, 2010. ^ "State Cigarette Excise Tax Rates" (PDF). Retrieved November 9, 2016. ^ O'Neil, Tim. "Missouri keeps tobacco tax as the lowest in the nation". stltoday.com. ^ "Best Cities for Smokers". Forbes. November 1, 2007. Archived from the original on May 31, 2010. Retrieved July 31, 2010. ^ "Missouri voters reject tobacco tax hikes". KY3-TV. Retrieved November 9, 2016. ^ "Centers for Disease Control and Prevention, "Behavioral Risk Factor Surveillance System – Adults who are current smokers", September 19, 2008". Apps.nccd.cdc.gov. May 15, 2009. Archived from the original on March 10, 2010. Retrieved July 31, 2010. ^ "Mo. Rev. Stat. § 407.931.3". Moga.mo.gov. Archived from the original on August 15, 2010. Retrieved July 31, 2010. ^ "Missouri Department of Health and Senior Services, County Level Survey 2007: Secondhand Smoke for Missouri Adults, October 1, 2008". Dhss.mo.gov. Archived from the original on December 16, 2008. Retrieved July 31, 2010. ^ "Mo. Rev. Stat. § 191.769". Moga.mo.gov. August 28, 2009. Archived from the original on December 10, 2011. Retrieved July 31, 2010. ^ a b "City and Town Population Totals: 2010-2017". U.S. Census Bureau. Retrieved May 26, 2018. ^ Missouri Department Of Elementary And Secondary Education (September 2, 2009). "Home Schooling". Dese.mo.gov. Archived from the original on May 14, 2011. Retrieved February 20, 2010. ^ Don Colborn, PhD. "HLGU – About HLG". Hlg.edu. Retrieved December 10, 2011.